Figure 1. 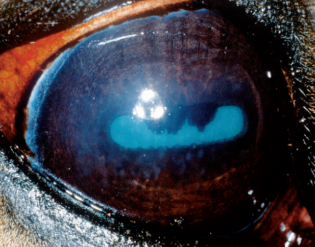 Superficial punctate ulcerative fungal keratitis in the right eye of a 16-year-old Warmblood mare. Note the small corneal opacities and the miotic pupil. Source: Andrew S.E. and Willis A.M. (2005) 'Diseases of the cornea and sclera', in Michau T.M. (ed.) Equine ophthalmology. Missouri: Elsevier Inc., pp. 157-251. Figure 2. Superficial punctate ulcerative fungal keratitis after application of rose bengal stain in a 14-year-old Arabian gelding. Figure 3. 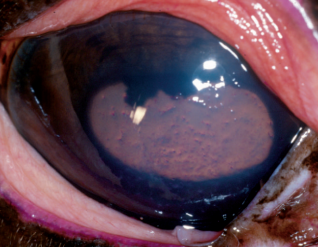 Keratomalacia or corneal melting in the right eye of a 5-year-old Paso Fino stallion with sterile keratitis. Figure 4. 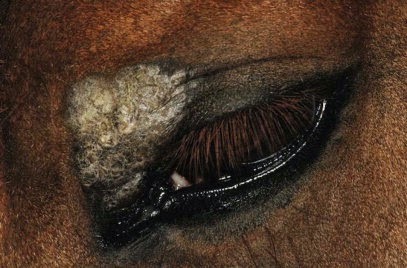 A nodular type B sarcoid (also involving the epidermis) on the lower eyelid of a 6-year-old Thoroughbred. Source: McAuliffe S.B. (2013) Knottenbelt and Pascoe's color atlas of diseases and disorders of the horse, 2nd edn., Liverpool: Elsevier Ltd. Figure 5. A verrucose sarcoid on the upper eyelid with thickened hyperkeratotic skin. Figure 6. 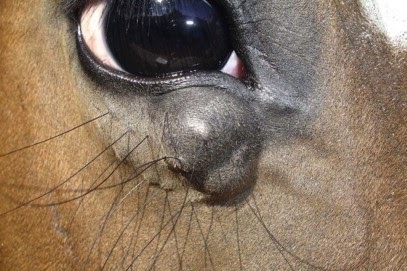 Focal subcutaneous nodular thickening under the lower eyelid in a yearling, representing a nodular type A sarcoid. Andrew S.E. and Willis A.M. (2005) 'Diseases of the cornea and sclera', in Michau T.M. (ed.) Equine ophthalmology. Missouri: Elsevier Inc., pp. 157-251. Brooks D.E. (2002) Equine ophthalmology, 1st edn., Verlag: Teton NewMedia. 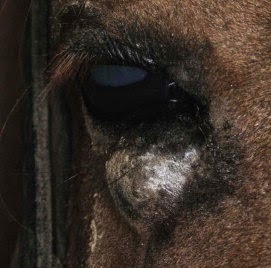 Brooks D. E., Andrew S. E., Biros D. J., Denis H. M., Cutler T. J., Strubbe D. T. and Gelatt K. N. (2000) 'Veterinary ophthalmology', Ulcerative keratitis caused by beta-hemolytic Streptococcus equi in 11 horses, 3(2-3), pp. 121–125. Bruce H.G., Cheryl L.C. and Robert L.P. (2004) Veterinary ophthalmology essentials, 1st edn., Philadelphia: Elsevier. McAuliffe S.B. (2013) Knottenbelt and Pascoe's color atlas of diseases and disorders of the horse, 2nd edn., Liverpool: Elsevier Ltd.
Thomas P.A. (1994) 'Institute of Ophthalmology', Mycotic keratitis — an underestimated mycosis, 32(4), pp. 235-256.